The county recovers the loss of uncollected property tax revenue at the annual tax sale. The county sells its tax lien on real property to attending purchasers for the amount of taxes, interest, and costs associated with the sale. The notice of sale along with the properties listed for sale, must be published for three consecutive weeks in a legal newspaper within the county. The Wyoming Tribune–Eagle is the local newspaper. As a general rule, this office publishes this notice every Thursday for the three weeks preceding Cheyenne Frontier Days™, which takes place the last full week in July. The sale is held the Thursday following the end of Frontier Days™. State statute provides a tax lien purchaser interest at 15% per annum in addition to a 3% penalty the day of purchase. Subsequent year taxes may be paid by the purchaser and also earn 15% interest. It is important to take notice that Laramie County does not warrant the property when selling the tax lien. It is a buyer beware market. For information concerning pre-registration please call the property tax department at 307-633-4225. A participant of the sale cannot pick and choose properties for purchase. Instead, the treasurer announces each delinquent property by owner name and amount due. After each announcement, a number is drawn. The participant's number which matches the number drawn has the option to purchase the lien or pass. In the case of a pass, another number is drawn until the lien is purchased. This process is repeated until all liens are sold. All liens purchased at the sale must be paid upon completion of the tax sale. Cash, ceritified funds, personal checks and credit cards ( Discover, VISA, MasterCard, AmEx ) are accepted methods of payment. When using a credit Card, a user fee is charged. Returned checks may result in the loss of liens purchased. A certificate of purchase is issued to the purchaser of a tax lien the day of the tax sale. 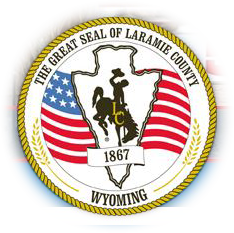 Laramie County maintains custody of the certificates of purchase. As redemption occurs, this office will send payment directly to the purchaser. When paying subsequent year taxes, this office needs the CP numbers from the tax receipts along with the CP holder's name. To pay in person, bring in the tax receipts. If paying by mail, furnish this office with the above information prior to the payment dates. We will provide the amount due and upon receiving payment, return paid receipts. The legal owner of the property may redeem taxes sold at the tax sale. To redeem, the owner must pay to the treasurer's office the amount of tax sold at the sale, a 3% penalty, 15% simple interest, and a redemption fee. Any subsequent year taxes paid by the certificate holder must also be paid, with interest, at the time of redemption. The purchaser can obtain a Tax Deed for the property if taxes are not redeemed by the property owner within four years from the date of the sale.